Description: Air Force Academy basic cadets practice the low crawl during the field portion of Basic Cadet Training. 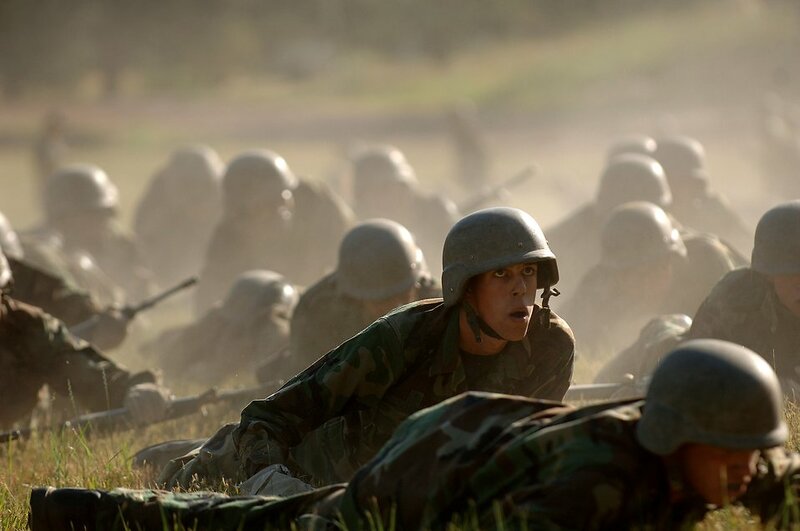 The training, which tests the cadets' stamina and determination, includes M-16 weapons training, obstacle and confidence courses, drill instruction and evaluation and leadership response course. A female soldier on top of a humvee at the 2009 Robins AFB Air Show. F-16 Air Force Thunderbird jets with crew members on a runway at the 2009 Robins AFB Air Show. A vintage WW2 airplane at the 2009 Robins AFB Air Show. An F-16 Air Force Thunderbird jet with crew members on a runway at the 2009 Robins AFB Air Show.